While the rest of the country is still thawing out from blizzards, Seattleites are sitting pretty by Elliott Bay sipping iced lattes. No matter which neighborhood you’re exploring, life is pretty grand in Seattle. Now, it’s a bit of a folly to say that spring is the best time to visit the Seattle when it’s truly a year-round destination. However, here at Expedia Canada, we feel like spring is a prime time for an epic trip to the Emerald City–which is why we partnered with Visit Seattle to bring you seven reasons to visit this spring. Seattle knows a thing or two about food. That’s why there are 13 James Beard winners, numerous 5-star restaurants, and one of the country’s oldest farmers markets within city limits. While it’s never a bad time to taste test the city, make plans to visit in April during Restaurant Week. You want clam chowder so thick it sticks to the spoon? You want specialty fruits and wines that grow exclusively in the Washington region? This is the week to get your feast on. Official Restaurant Week dates will be announced soon. The Pacific Northwest is known for being a little quirky, and Seattle fully embraces its creative reputation. This spring, see works from some of the most ambitious filmmakers at the Rainier Independent Film Festival, May 15-17, 2015. Most movies will be shown in Ashford Valley, 80 miles outside of downtown Seattle. Film venues in previous years have included yurts, elementary schools built in the 1920s, and renovated theatres. Loud and proud and a little weird, it’s the Seattle way. Take me out to the ball game, take me out to the crowd, buy me some peanuts and Cracker Jack®, and let the Seattle Mariners stand out from the pack! Spring means baseball, and the Mariners are ready to come out swinging. During the off-season, the team acquired stars like Nelson Cruz, Seth Smith, and Justin Ruggiano, who are all looking to push the Mariners into playoff territory. Bring your good luck charms with you to Safeco Field and watch the team. Seattle’s art scene is well-respected. 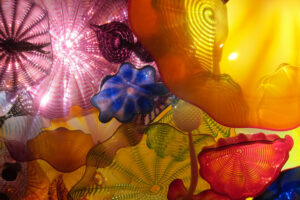 Between the Chihuly Glass Museum and the Seattle Art Museum, there are a ton of classic and avant-garde works to admire. On warm spring days, venture into Olympic Sculpture Park. Founded in 2007, the free public park showcases award-winning sculptures and designs on the lawns. This spring, Sam Vernon’s work will be featured on the pavilion, showcasing black and white graphics with hidden characters peeking from the shapes. Take a peek yourself when his exhibit goes on display March 28, 2015-March 6, 2016. In Seattle, a little water never hurt anybody—especially in spring. This makes it the perfect season for the yearly Moisture Festival, a near-month long celebration of comedy, circus, and burlesque. Most acts last roughly 15 minutes a piece, with an accompanying band. Catch a show (and maybe a few juggling sticks) when you book front row seats. Performances are scheduled to take place in the Fremont and Capitol Hill neighborhoods between March 19-April 12, 2015. You can forgo the giant crowds of spring music festivals and still have an amazing time in Washington. 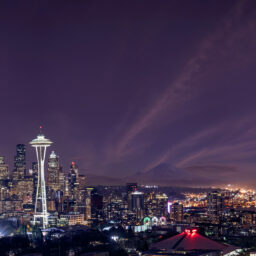 Seattle has the second-highest per capita rate of live music performances in the country, just outside of New York City. Catch a show at Neumos, the Moore Theatre, or Neptune Theatre for a performance you won’t forget. Vance Joy, of Montreal, and the Ting Tings (that is their name) are all playing in Seattle this spring. Come in closer and we’ll tell you a secret: Seattle has less annual rain than Houston, New York, Memphis, and a number of other U.S. cities. Furthermore, Seattleites buy more sunglasses per capita than anywhere else in the country. While you won’t experience roasting hot spring days during your trip, it is still nice enough to rent a bike and pedal around town. 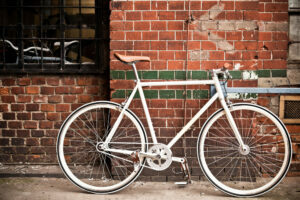 Popular routes include the Burke-Gilman Trail along Lake Union and deeper cuts like Sammamish River Trail. This spring, mark your calendars for a trip to the Emerald City. 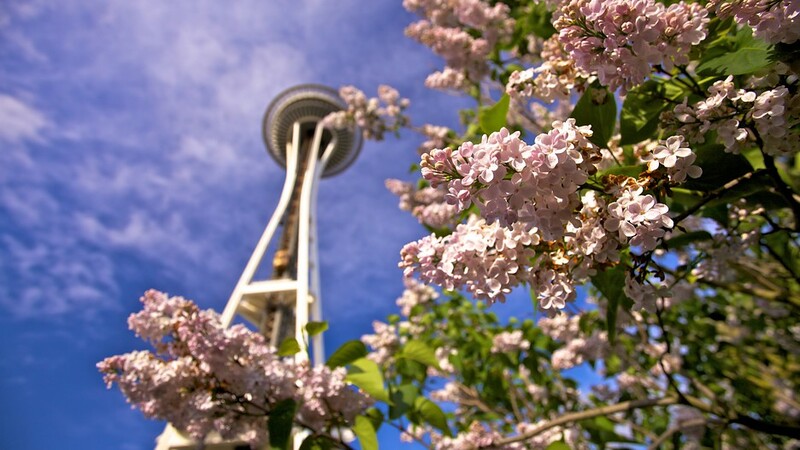 Whether the town glitters from the rain or the spring sunshine bouncing off the Space Needle, it’s a city you simply have to see. Still searching for other ways to experience Seattle? Find out what to do if you only have 36 hours in Seattle.